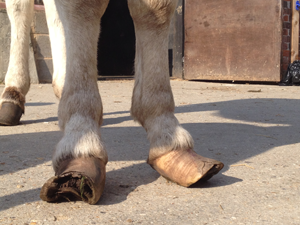 A woman has been given a suspended prison sentence and disqualified from keeping all animals for five years after a horse and a donkey were found with hooves so overgrown they could barely walk. 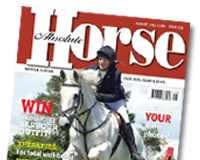 The horse also had an infection on his chest so severe that it had become large, ulcerated and bleeding. Rachel Hindley of Beecheno Road, Norwich, was sentenced to eight weeks custodial sentence, suspended for two years, and made to pay £200 fine and £80 costs at Norwich Magistrates’ Court on Wednesday 18th March). She had previously been found guilty of offences under the Animal Welfare Act in her absence on 27th January. The RSPCA and Redwings Horse Sanctuary attended the field in Marl Pit Lane in June 2014, along with the police, a vet and a farrier after concerns had been raised about the welfare of the two animals. They found a skewbald donkey and a dark grey pony, now named Rio and Zeus, both with extremely overgrown hooves. Zeus also had an infected sarcoid on his chest. The vet said the horse and donkey were both suffering and they were taken by the police and placed into Redwings’ care. Rio and Zeus were taken into the care of Redwings and have since undergone extensive farrier and veterinary treatment.